Aaron Sinift (b ’66) is an artist living and working in Beacon, NY. He has a BFA in painting from the University of Iowa (96′) and an MFA from Boston University. He instigated the 5 Year Plan project 5 Year Plan.org to engage with Gandhi ashram khadi collectives to deepen his understanding of life in India from the perspective of Gandhian service, which he has found to be life changing. He lives with wife Greta Byrum and 4 year old son Orion. “Weaving Stories: Artists in collaboration with Gandhi Ashrams” is to be published as an article in a forthcoming book Freedom of the Presses: Artists’ Book in the 21st. Century. It is a personal reflection. 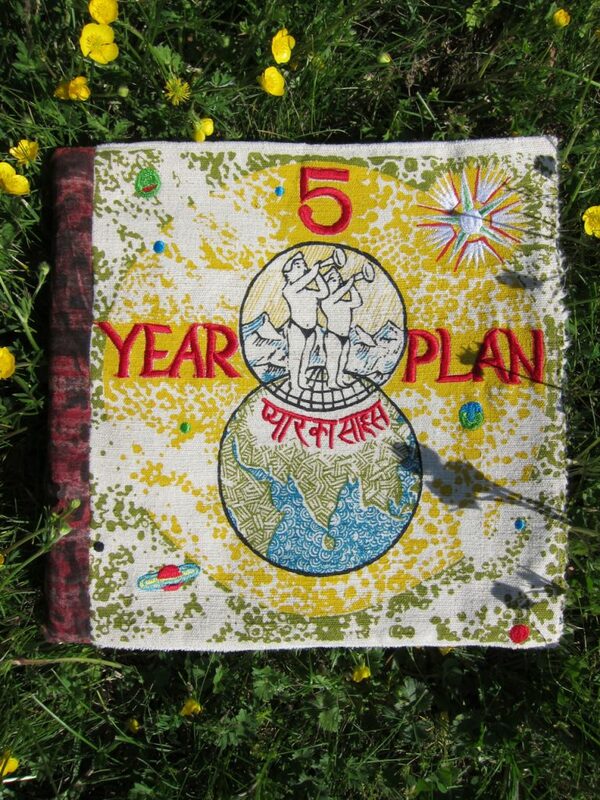 It explores how the idea of a 5 Year Plan book was conceptualised and how Gandhian ethics and economics underpin the project. It then goes on to present the evolution of the first two books, 5 Year Plan and Other Imaginings. The article is published here as a 5 part series. My wife had given me her old computer so for the first time I started searching the internet looking for information on Gandhi ashrams in India which turned out to be difficult because the ashrams in 2009 were not online, and most still aren’t. I read lots of graduate thesis and academic reports that had anything about Gandhi ashrams in them. I reached out to dozens of of strangers and workshops, occasionally receiving replies but no solid information. I wrote to a friend living in Vrindavan (Krishna’s hometown in India), a textile expert and wonderful human being named Robyn Beeche. She immediately responded that she had just been to a textiles conference and that there was a real need for something like this, that weavers have their backs against the wall and what they needed was something that they could make in large numbers like a Gandhi cap, to support their families. Eventually I reached out to a shop in New Delhi called People Tree which had inspired me since ’93 with its activists books and handmade clothes and artist freak sensibility which can seem very rare in India and which had a strong effect on me, though I had never met the owners. I ordered research books through them and developed a rapport online. I explained what I was doing and why I was doing it and asked if they knew of any Gandhi ashrams I could work with, they gave me the phone number of Mr. Handa of the Gandhi Hindustani Sahitya Sabha (Gandhi Hindustani Literature Society, GHSS) in New Delhi. When I called him he was friendly but we basically had to shout over the line and all I understood was that he was willing to meet me. 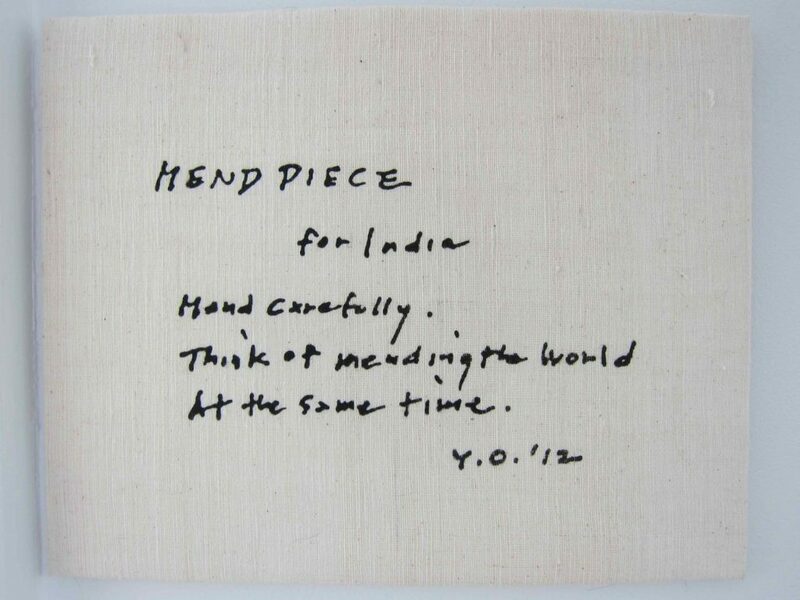 Printed in the second book, ‘Other Imaginings’ (©Yoko Ono. Used by Permission), wood block print by Chinmoyee Kala Niketan, Varanasi, on homespun khadi cloth. I heard about Kickstarter, and crowd funding meant we needed a website. Since I had no computer skills but lots of experience doing old-school punk zines, I designed the website the way I did my notebook pages, drawing in the links, writing all the text by hand, and posting in the illustrations collage style. These pages I scanned and sent to Steven Warner, a long term collaborator who turned the drawings into functioning links. Friends of John Studer provided help with sales page, and we launched the website on October 2, 2009, which by chance turned out to be Gandhi’s birthday, an encouraging synchronicity. Pre-selling a book is not easy but I got lots of help from the art world, particularly Hudson at Feature Inc. whose contacts and endorsements went a long way and opened many doors to the 5 Year plan idea. I canvassed consistently, following every lead that i had energy for and wasting a lot of time, but also learning what to avoid. Everything taught me something, one apparently fruitless sent me to Brooklyn Artist Allaince (now Brooklyn Inc.) where I met Directors Kurt Allerslev & Marshall Weber whose vision was ahead of the curve on the possibilities of artist books. They liked the idea and agreed to offer it to their institutional clients which proved to be enormously helpful in validating the project once The Boston Athenaeum and Stanford University pre-purchased copies for their special collections libraries. In December I was stunned to receive an email written by Nandita Devraj, informing me that she and her husband Tarun had been in an auto accident and that he had not survived. She would be carrying out our work together on the book. By March 2009 I had raised $25K from pre-sales of the book and borrowed $15K to make the $40K necessary to create the edition of 180 books. I had my passport and visa to India and a few phone numbers and contacts but no certainty as to who I would be working with, never having met any of them in person. Everything would have to be worked out once I got there, and only I had 3-4 months to complete my work. Arriving in India, my first stop was Varanasi, the city of Shiva, where I’d studied sculpture and where I met with good friends who shared their advice and met Kahkashan Khan who in the future turn out to be a great collaborator. In Delhi I met Gurpreet Sidhu and Orijit Sen of the People Tree Collective who kindly offered a place to stay as “artist-in-residence” in their workshop. 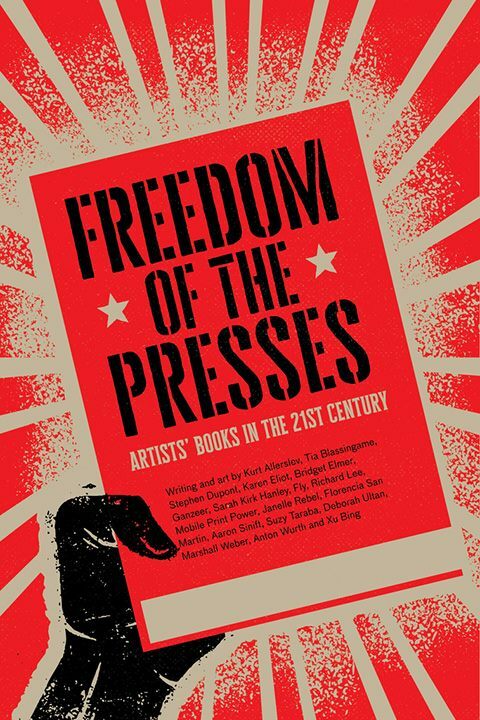 This turned out to be enormously helpful because artists and activists were coming around constantly, offering advice and suggestions and unexpected perspectives while designers and cartoonists worked out their ideas on various ongoing projects simultaneously. Their pace was purposeful yet relaxed, serious but casual. and for me very instructive & stimulating. Orijit pointed to me that the 5 Year Plan logo, which I had lifted from advertising label, was actually the symbol of Gemini Studios, the great 1950’s Bollywood of Tamil Nadu, “a lift of a lift” he chuckled.